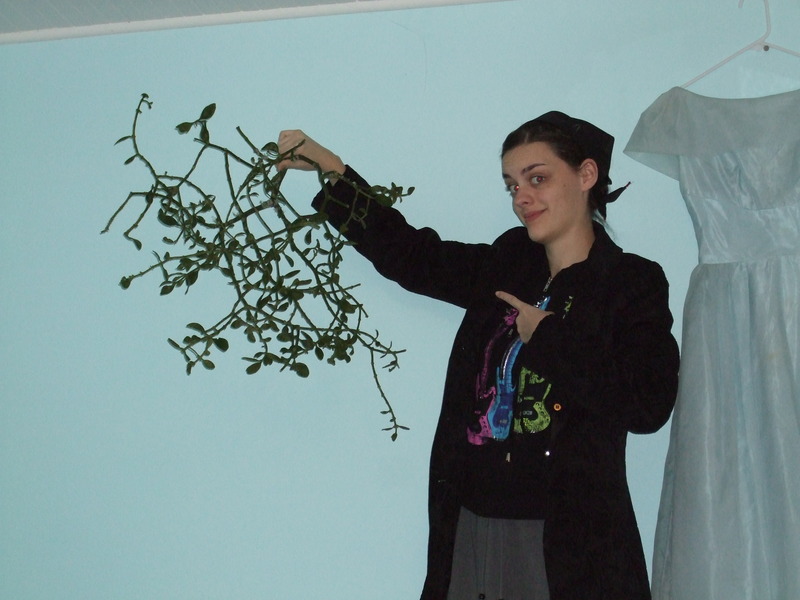 That, my dear friends, is a giant clump of mistletoe. I am afraid we have been attacked by the giant kissing giants. But the giant kissing giants are, of course, friendly giants so an attack from them means that they will give you mistletoe. Maybe knock over a big tree as well. Today I went to see Randy and Shelley’s baby Jocelyn and of course she was soooooo adorable and had these long perfectly formed fingers and toes that just amazed me. Sometimes it seems like babies should have doll feet. They don’t. They have these amazingly real feet only teeny tiny and I could stare at them for a long time. I am posting this picture so that you will think, “oh, I understand now. Some of my sweaters look like that when I raise my arms. I really need a tutorial to tell me how to fix that.” Because I am planning on making a tutorial. Sometime. Soon, I hope. I have decided to become a REAL blogger and blog like, every day and post pictures and furthermore comment on people’s blogs and everyone will say “Emily is a REAL blogger.” Wouldn’t that be nice? You can now subscribe to my blog using the link on the side and some people have and that makes me happy. Oh yes but the problem with taking pictures is that I am a terrible photographer, I have no camera, and google images is blocked on my home computer. New Years tonight! Party party party! So you had me all set up there. I was sure there was some wild imaginative story coming about the friendly attacking giants actually kissing you under the big hunk of mistletoe, instead of just handing it to you. Well seeing as giants usually have beards, this is just as well…..
Did you hear how I lured your unsuspecting little bro under the mistletoe in the doorway?? “I wanna see something here on your shirt,” I said, pulling him over. “Huh? ?” he said. Now he flinches when he walks into the living room.